The elite of the Sultansworn bend the knee to the sultanate of Ul'dah, swearing a solemn oath to serve the nation as its sword and shield. Clad in brilliant silver armor and called paladins, these men and women were once the pride of the nation, held in high esteem by nobles and smallfolk alike. But their glory days are no more, for as the sultanate's power waned, so too did the prestige of the paladin. They are now but a shadow of their former selves, and the sultana must needs turn to sellswords for protection. In these troubled times, command of the Sultansworn has fallen to a young paladin named Jenlyns. Desperate to restore their honor, he has resorted to recruiting outsiders and training them in the legendary battle arts of the paladin, once a closely guarded secret. 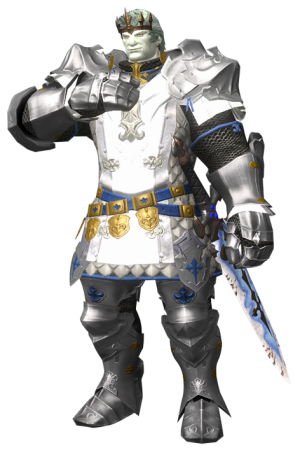 Patch 1.21 saw the introduction of jobs to FFXIV, which allows you to become one of the traditional jobs from the FF series after completing a quest. A Gladiator can become a Paladin by equipping the Soul of the Paladin item after completing the first quest. The details for this quest are below. Paladin is a tank job which uses defensive tactics to hold enmity. It is still capable of dealing decent damage however this should not be your main priority - you should always focus on defense before offense. As a Paladin your main stat is Vitality (VIT) as this increases your HP and allows you to survive big attacks from bosses. You should be focusing on equipment with this stat. It is also worth looking at equipment with Strength (STR) to increase your damage and the percentage of damage mitigated by block and parry as this will be useful in boss fights. For secondary stats you should be focusing on the likes of Direct Hit Rate, Determination, Critical Hit Rate and Skill Speed in addition to simply boosting VIT. However you'll find Skill Speed is generally not worth it. Actions are skills that the Paladin can equip to their bar and select to use at any time as long as their timer is available. Actions used in a combo will generate additional damage and effects. All Paladin actions are exclusive to that job. Deals additional damage with a potency of 75 after each auto-attack. Damage affected by weapon delay. Cannot be used with F201F4F201F5Shield Oath0101. Upon HP recovery via healing magic cast by self or a party member, a protective barrier is cast on all party members within a radius of 15 yalms. Effect ends upon additional HP recovery via healing magic. Reduces target party member's damage taken by 10%. Deals unaspected damage with a potency of 380. Delivers an attack with a potency of 350. Potency decreases as own MP decreases. Increases block rate to 100% and creates a designated area in a cone behind you in which party members will only suffer 85% of all damage inflicted. As well as these the Paladin can also equip Gladiator actions. The Paladin job has the following combos which can be executed. These will give extra damage and effects. Since the Stormblood expansion for FFXIV, cross class actions were removed and replaced with the concept of "role" actions. Role actions are more generic as they don't belong to specific classes, but instead to roles such as melee DPS, magic DPS, healer or tank. The Paladin can equip up to 5 of these. From the Stormblood expansion PvP was revamped significantly and you can no longer use PvE actions during PvP battles. That means all of the actions above you can no longer use in PvP. Action Points (AP) were also removed. While some of the dedicated PvP actions do have the same name, they will have different potencies or effects. Below are the PvP actions that are unique to the Paladin. There exists even more PvP actions and even traits but these are not unique to the Paladin. You can find these further down the page. Reduces damage taken by self and nearby party members by 25%. The best equipment for your Paladin constantly changes depending on what was added in the latest patch so it is important to do your own research on top of this guide. We have broken the equipment down into tiers in order to give some indication of what you can use before you get up to that item level tier. I found that after 45 is where you really see pld grow as a tank. I have my pld to 50 and am working on valor gear. It seems like war is better at the beginning, but now I see how much I love my job. I have played as both. It's worth it if you want to be a main tank and really have high health and hate (enmity). Personally I think pld is better, but I might be biased. The cross class abilities from mar make it worth it. You get the best of both worlds. I might be missing something, but isn't it kind of crappy that Paladins lose out on a lot of helpful cross-class abilities that are available to Gladiators? If I were to switch to Paladin I would lose 70% of my (hypothetical) cross-class build: Raging Strikes, Invigorate, Hawkeye, Featherfoot, Second Wind, Keen Flurry, and Haymaker. While Shield Oath and Cover would undoubtedly be good for tanking (especially in situations where you can't prevent other party members from taking damage by simply holding aggro), do they sufficiently make up for this shortcoming? Maybe I'm incorrectly assuming that Hallowed Ground will cause enemies to lose interest in you? I'm only at level 28. Both Defiance and Shield Oath will increase effective hp by 25%. If you take 20% less damage the effect to health is 1.0/.8 --> 1.25. That said, what really matters is the Wrath 15% increase to healing taken, but there Warrior definitely falls short of Paladin in terms of how much healing is needed to keep the tank alive. Even if the two passives/buffs were equal, the stronger the boss is compared to your heals, the further that pushes PLD ahead (though, vice-versa on weak enemies). A 2.0 Warrior is essentially a matter of big numbers when in small ponds. It can practically self-heal WP and AK bosses, but as soon as something is seriously bigger than it is it falls behind Paladins, who scale with the enemy rather than being limited to their own stats. 2.1 Warriors will still likely fall behind Paladins in situations of extended streaming damage, but can burst mitigate more often. This still makes Inner Beast-Infuriate-Inner Beast more effective than Sentinel, lasting 12 compared to Sentinel's 10 seconds, and at a third of the cooldown (in addition to the 2-minute CD Sentinel's reduction currently listed for Vengeance), but consider also that PLD is still walking around with a permanent Rampart and one more main mitigation ability than Warrior (IB[~20-], Foresight, Vengeance, (Featherfoot), (Storm's Path[7.5]), vs. Rampart, Foresight, Sentinel, Bulwark, (Flash), (Hallowed Ground). As for the tank buffs, Defiance is actually better due to the other effects it has besides HP+ and enmity+. As you stack Wrath you also get a 15% increase to healing taken (and crit). Paladins, however, have the ability to block as well as a no-cd stun. Both types of tank are necessary, both are just as good in many situations. Shield Oath scales with damage, Defiance scales with WAR's health. It's easy to see why Shield Oath is better. In regards to defiance looking better than shield oath I would actually say that shield oath is a bit better than defiance. Both increase survivability by exactly the same amount, yet shield oath has a smaller damage reduction (20% vrs 25%). The math is that a 25% hp increase is exactly 1/5th of your new hp total which is now 125%. Here is a video showing the paladin quest giver location..
Well i was playing around with a equal lvl warrior in an instance last night and we were taking turns tanking mobs. I gotta say it was different. Fact of the matter is paladin is gonna hold hate better most of the time.... I simply had more "oh crap" buttons to hit. Secondly with the cycling of job abilities and shield oath I took significantly less damage. His mobs died a little faster while my mobs were a little less mana intensive on our healer. At this stage in the game it doesnt feel like a huge difference. "Increases maximum HP by 25%, while lowering damage dealt by 25% and increasing enmity. "Reduces damage received by 20%, while lowering damage dealt by 20% and increasing enmity. Cannot be used with Sword Oath. Effect ends upon reuse." Seems unfair that the WAR gets 25% more health while the PLD gets a damage reduction (Yes I understand that Tank require Damage Reduction skills) and the ten lvl difference also seems slightly unfair. Best cross class IMO is Stoneskin, Forsight, Bloodbath, Mercy Stroke and Cure. Skull Sunder is completely pointless, Protect is better left to healers, raise cant be use in combat, fracture only raise your dps slightly and doesnt generate much enmity. how to use the cross class ability? are these the only cross class skliss for paladin? because gladiator is able to use a lot more refering to the guide.